The medium frequency casting machine (dental lab equipment)has an advanced all-transistor circuitry, which makes it a highly efficient, low power consumption and low power rating (2.5kW) machine. No preheating is needed, melting and casting can start immediately after the machine is turned on, the interval between melting and casting is two minutes. 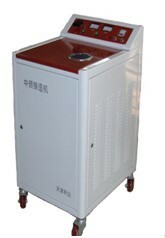 The machine can work under the voltage of 220V± 10%. Low working voltage and low high-frequency radiation makes it safer and more reliable. Technique data: 1. Voltage: 220v/50hz± 10% 2. Power: 2500w 3. Cenrtifugal rotational speed: 550rpm 4. Maximum melting amount: 50g(Co-Cr alloy) 5. Melting duration: 30g≤ 65s(standard) 50g(1.5min-2min) 6. Casting radius: 21cm 7. Casting method: Induction casting 8. Cooling method: Air cooled 9. Motor power: 370w 10. Dimention: 52x52x94cm 11. Package size: 61x60x111cm 12. Weight: 100kg Trademark: LZ Packing: standard export package Company: Tianjin Lizhong Electronic Co., Ltd.